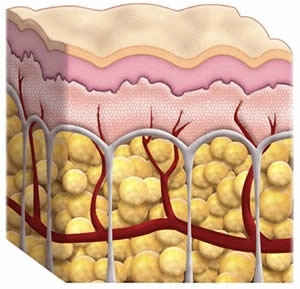 Cellulite is best described as a condition of uneven deposits of fat, water, and wastes that have become trapped in connective tissues of the body just below the skin's surface. Cellulite occurs primarily in the hips, upper thighs, abdomen, buttocks and upper arms. Studies of cellulite found the biggest contributor toward a cellulite condition was poor blood circulation. However, toxic accumulation and fluid retention are major contributing factors in the formation of cellulite. Loss of blood flow to an area, whether from lack of exercise, excessive sitting, clogged arteries, or nutrient deficiency, can have a disastrous impact on cellulite formation. According to cellulite experts, cellulite generally accumulates in areas with poor circulation, and as a result, the toxins and waste materials get more clogged and harder to remove. Anyone that has cellulite, or the dimpling of the skin on the thighs, rear end, and even the lower leg area, knows that it is a very embarrassing and unsightly condition. Formostar treats cellulite and adipose tissue with far infrared radiation and specifically, is a method of selectively delivering targeted infrared energy to each clients individual areas of concern on their bodies. The treatment shrinks the fat stores and removes the toxins beneath the surface of the skin that are the root cause of the dimpled appearance of cellulite. In addition, the Infrared Body Wrap heat penetrates deep into your clients body to start liquefying the subcutaneous fat so that it gets released via the sweat and other body elimination systems. The Formostar Treatment significantly improves your blood circulation and by improving the blood flow to the target area, you can eliminate the conditions that caused Cellulite to form in the first place. In summary, when you shrink the subcutaneous stored fat cells and remove the toxins and retained fluids from beneath the skin surface, cellulite will no longer cause dimpling on the skin surface. A calorie is a measure of energy expenditure. The calories referred to in diet and exercise, are kilocalories (kcal), 1000 of the calories referred to in science labs for measuring chemical reactions. A pound of fat stores 3500 calories (kcal). To lose half a kilo of fat a week a person must eat approximately 500 fewer calories (kcal) per day than he/she expends. The range of daily calorie burning is from 1600 for a sedentary woman or older people, to 2800 for active men, very active women and teenage boys. You can burn up to 900 to 1400 calories or more in just one 50 minute session. Your body will burn off those calories through the day. The best of all is that the inch loss from infrared is permanent. The heat produced by the Formostar Infrared Body Wrap Treatment is similar to that of a cardio or physical workout all while laying down for a period of fifty minutes. This infrared heat stimulates the metabolism and increases blood circulation just like it would with a workout session. It will also increase your heart rate and increase blood circulation. This increased circulation will also increase your Basic Metabolic Rate and by doing so consumes or burns calories. As you relax in the gentle Infrared Body Wrap treatment, your body is actually hard at work producing sweat, pumping blood, and burning calories. As your body increases sweat production to cool itself, your heart will work harder to pump blood at a greater rate to boost blood circulation. The amount of calories burned during one session will vary from person to person depending on their size, but calories will be burned as if you had exercised. Your metabolism will also be stimulated for at least 24 to 36 hours after using this treatment. This means that your body will be burning calories at a higher rate for the next several days after using one treatment. Best results will be by using an Infrared Body Wrap Treatment at least twice per week. And drinks lots and lots of water. The Formostar treatment is a very natural non-invasive infrared light therapy processes that reduces body fat, removes stored toxins and enhances body metabolism, resulting in tighter, smoother looking-skin and a streamlined form without sacrificing the curves your clients want to keep. Target specific body shaping, cellulite reduction, skin rejuvenation and a better overall sense of enhanced well being is exactly what you are seeking. When we accumulate body fat, blood circulation becomes worse. Because of a lack of blood circulation, we cannot metabolize or burn body fat. In addition, very little heat is being circulated to that part of your body. This is what we call "cold spots." When we take away the heat from that area of your body and it cools, the fat then turns from subcutaneous fat into cellulite. Subcutaneous fat is very soft and easy to lose. Cellulite is almost like hard muscle that is hardened from lack of blood circulation. The purpose of the InfraRed Body Wrap Treatment is to apply heat to the body in order to get underneath the fat tissue and thin the blood to allow it to get into the areas where fat tissue exists. Bringing the blood back into the areas that have had restricted blood flow causes the metabolism rates to rise. The heat softens the fat tissue causing it to break up and be released into the blood stream in the form of calories to be burned up as energy. When we have an excess of calories, the body stores them as fat. The InfraRed Body Wrap Treatment reverses this process by breaking the fat down into calories and placing them back into the blood stream to be used as energy. You can burn up to 900 to 1400 calories or more in just one 50 minute InfraRed Body Wrap Treatment. Your body will burn off those calories throughout the day.